When you shop for light bulbs you want to think about Lumens, color temperature, and Color Rendering Index (CRI). 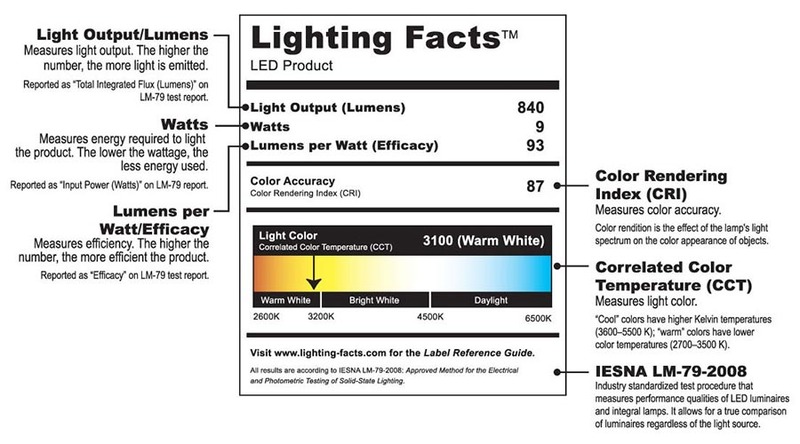 An easy way to determine the light appearance of a light bulb is to look for the Lighting Facts Label on the package. The Lighting Facts Label will give you the all information you'll need to compare different bulbs and will appear on most everyday household light bulbs starting in 2012. Color temperature is a characteristic of visible light that has a very important application in lighting and other fields. The color temperature of a light source is the temperature of an ideal black-body radiator that radiates light of comparable hue to that of the light source. Color temperature is conventionally stated in the unit of absolute temperature, the Kelvin, having the unit symbol K.
A traditional 60watt incandescent light bulb has a color temperature of 2,700 Kelvin. When lighting building interiors, it is very important to take into account the color temperature of illumination. For example, a warmer (2,700 - 3,500K) light is often used in public areas to promote relaxation, while a cooler (3,500 - 5000K) light is used to enhance concentration in an office space. Color rendering is the effect of an illuminant on the color appearance of objects by conscious or subconscious comparison with their color appearance under a reference illuminant such as the sun. The color rendering index (CRI) is the measurement of the ability of a light source to reproduce the colors of various objects faithfully in comparison with an ideal or natural light source. Light sources with a high CRI are desirable in color-critical applications such as art galleries, photography studios, retail spaces, and doctor's offices. Newer light bulbs like CFLs and LEDs are designed to use less energy. This makes wattage an unreliable way to gauge a light bulb's brightness. That takes lumens.